Entrepreneurship has always been a sought after area for management students. And it is crucial for them to have a firm understanding about the challenges and environment. 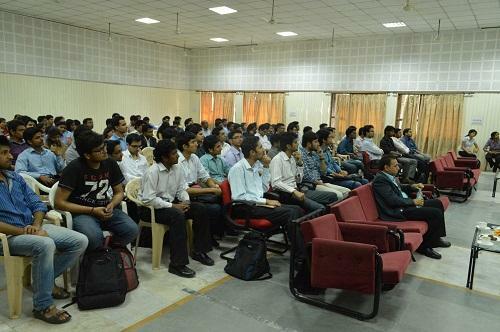 On 20th March 2013, we were fortunate to listen to two eminent industry experts Mr. Hersh Kumar and Mr. Sanjay Kumar. The students were ecstatic and looking forward to a learning session. A welcome note is presented for the guests. Mr. Hersh Kumar has done his engineering from IIT Roorkee in 1978 batch with a gold medal. He also completed his masters from Wayne State University, USA. He is also a distinguished alumnus of IIT Roorkee. He is a social entrepreneur and founded over 67 companies worth several billion dollars. Currently he is the chairman of AK Shipra Group. Mr. Hersh started by saying that the first myth about being a successful businessman is that one need to have a management degree. He said that not having an MBA degree is good for him as it allows out of the box thinking. He also stressed on the fact that a new generation is better than the older one. He recalled his interaction with his son and how the new generation is doing a good job. The speaker advised not to consider choosing a career as a starter. We should not plan for either job or career, we should plan for life. One has to have a holistic view and he/she should follow the passion. Mr. Hersh encouraged us to follow the path of entrepreneurship. According to him, this is the way to utilize our degrees to the fullest. Even if one is not in the position to go for it, one should keep that window open for the future. Now the world has been changed and the chances of us being a billionaire are no less than his own son. He stressed on that fact that all successful people didn’t have money when they started their journey. Therefore he exposed another myth that one need to have money in order to start up a business. Other myths he talked about were, one has to be clever and dishonest. The speaker narrated that simplicity is the key as it makes thing easier. One should make it less complicated rather than other way around. He also said that dishonesty doesn’t pay in business. He emphasized that it takes years to understand it. He also said that the new generation is much smarter however value systems are declining. He suggested we try to avoid short cuts. In other words, thrive on your strength not other’s weakness. Another misconception he talked about is perceived business traits. He named a few communities who are considered more business minded than others. However we should not get bogged down by these perceptions. Business is all about learning. We should not look any characteristic as a handicap but as an advantage instead. He discussed another false impression that bravery is not a virtue in business. He said that business is similar to a war and one need to be a brave hearted. A good business does not flinch in adverse situations and leads the whole team towards the success. Mr. Hersh busted another myth that we need to hire people who are not smarter than us. He said that we should actually go for smartest person available. He gave us an interesting theory. He said that usually a person is hired for a job that is, first a job is available and then we look for a suitable person. He said that in his organization, the process is reversed. Initially a person is found and then an appropriate job is created for him/her. Mr. Hersh said, "When building your company, your first problem is that others may not run your company as good as you do. Even if they do, you may still think that they can't. So when you hire people, you may feel that they do not have all the wisdom you have. You may feel that you can run this company better. But one person cannot run a whole organization. You have to give authority to others. You have to put faith in them." 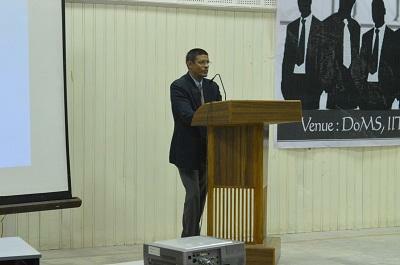 The speaker also talked about one of the biggest misconceptions is that an emotional person cannot be a successful businessman. He said that it's the attitude of a person that matters. Emotions are like a river. They can either flood a place and cause destruction or they can nurture the place and bring life. One should try to make it an asset, not a liability. After explaining his opinions on several myths Mr. Hersh also discussed some other challenges. He said that in his generation, alliances were seen as a sign of weaknesses, incompleteness or dependency. This leads to the bitterness. However one should be open to the thought. The speaker shared his experiences that he realized it some years ago and it has been beneficial. Mr. Hersh said that a businessman should be like a fatherly figure. As for him, his 80% of the time is spent on mentoring and only 20% of time on other stuffs. This is in contrast to general scenario where a lot of time goes into executing and very less amount on guiding. The speaker concluded by saying that one should never fear of the obstacles. He advised us to live life our own way. He said that as we are not weak person hence we should not act like one. This ended the insightful lecture and we had a question answer session. 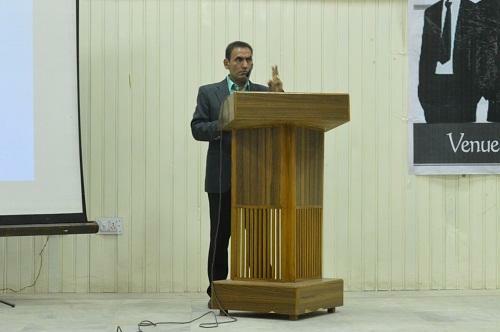 The students raised several queries which were aptly responded by the speaker. 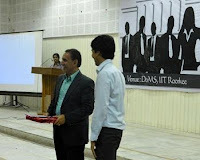 We were also fortunate to have Mr. Sanjay Kumar with us. Mr. Sanjay is a 1985 batch pass out from IIT Roorkee and hold MBA degree from Pune University. He has served Indian army for 25 years. Presently he is heading Saumya DSM Infratech Limited as Chairman and Managing Director which is one of the group companies under AK Shipra group. Mr. Sanjay also shared some insightful views about his journey and experiences. 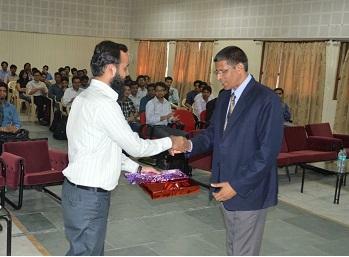 He shared some valuable tips related to corporate world. After these enriching sessions, a note of thanks was delivered and mementos were presented to these distinguished personalities. 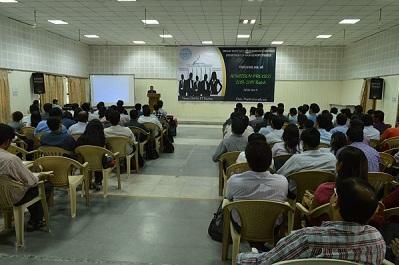 The sessions were extremely learning and provided new insights into the subject of entrepreneurship. As a very true and inspiring Guide and Mentor , Mr Hersh has given us many insightful stories about how to succeed in the 21st century corporate world.He himself is the testimony of that very success formula. Am fortunate to have him as my Guide and Mentor !